Bogtrotter hails from Minneapolis but his music makes him sound as if he’s emerged from a slimy test tube in an Area 51 laboratory. His trippy, drippy downtempo and menacing, experimental breaks have been leaving a soaking trail of grime and slop across Shanti Planti and Merkaba Music this past year. 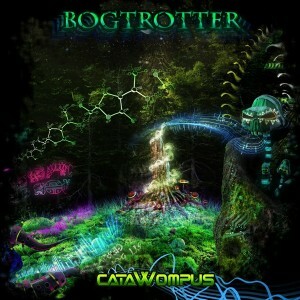 But with his latest release, Catawompus, Bogtrotter has completed his evolution into a venomous, technologically-powered force to be reckoned with. Mastered by Ion Driver with artwork by Hakan Hasim. MP3 Download | FLAC Download | WAV Download · Download count: 9,239. Been a huge fan for some time now! This is just a massive release, TOTALLY worth a listen! Awesome melodies, awesome sound design, awesome funk! AWESOME !! Everything is just perfect, from the cover art to the high quality mastering and of course the tracks themselves. Ohw yeah, just the way I (we) like it ! Thanks for sharing this wonderful release ! ***** stars 4 sure ! I like how you moved in a more bouncy glitch hop direction from the previous EP. This music is just plain awesome electronic music. Call it whatever genre or sub genre you wish but to me, this is some of the more brilliant digital manipulation of sound that I’ve heard. Definitely a must for anyone who likes cool trippy electronic music. thak you comrade! for mother russia! construction complete! This is very cool. Glitchy but with a downtempo flavor so as not to alienate the psychedelic crowd… very BOGgy… like being in a forest marsh. Conveys an extra dimension to the world of sub-sonic . . !! wow!!! I can tell the artist put a great deal of work and effort into his music. The intricate glitchy patterns are paradoxically both rhythmic and unpredictable. This may very well be the music our unknown reptilian alien friends listen to on a daily basis. 5/5! 183 MB of >99.99% pure splendidness! Exactly what I need at the moment. I can’t get my ears off it! Rhythms is probably the best track I’ve ever heard in electronic music! Nice!! Another good album! Keep it up!